Self-driving cars now regulated in Nevada. 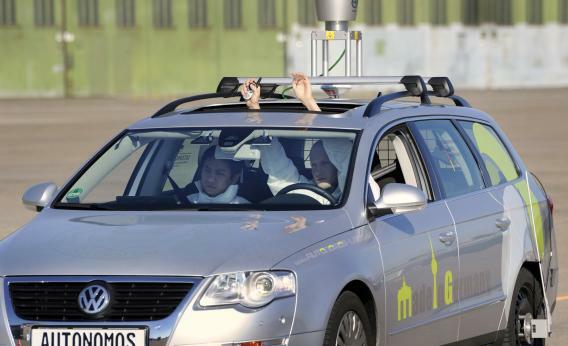 A driverless car is tested in Germany. Yesterday, Nevada became the first state to approve regulations that permit self-driving cars. Since the legislation process began last June, Nevada officials worked with insurance companies, car manufacturers, law enforcement and testing professionals to develop rules mainly aimed at safety, according to PC magazine. The regulations spell out procedures for testing the vehicles now and requirements for use by residents in the future. The robocars in the testing phase will have red license plates. Cars that have been approved for use by Nevada residents will sport green plates. The person in the car is considered the operator (and two people will be in testing-phase cars at all times). TechCrunch notes that as of right now, while people cannot operate the car drunk, they are allowed to text and make phone calls. In order for a company to test its self-driving car, the company must purchase a bond from Nevada, at the price of somewhere between $1 million and $3 million. While Nevada is the first state to approve and regulate robocars, Google has already tested its self-driving cars on public roads (see the car in action here). There were always people manning the cars (its first crash was actually the fault of a human), and Google notified local law enforcement in advance of any tests. Audi and Voltswagen are also working on robocars, according to PC magazine. The main benefits of self-driving cars include reduced fuel consumption as well as less traffic congestion and accidents. Widespread consumer adoption of the technology is still far away—taxi drivers, your jobs are safe for now. But the new regulations could have an immediate effect on the Nevada economy. The state has the worst unemployment rate in the country, having been hit hardest by the recession, according to CNN. As the first state to develop regulations for this emerging technology, Nevada may experience an economic boost as companies flock to the state to test their vehicles.